All parents have them and they’re starting to take over the house… Baby clothes and toys. From day one we receive tons of clothing items, toys, and gifts and while it can be exciting, it can also be overwhelming. Where do you put all of these new possessions? Now fast forward a bit and your baby has outgrown most of their cloths and will continue to do so for the next 20+ years. What should you do with all of those items? As your child starts outgrowing toys and clothes it’s important to start organizing items by size. Make sure items are clean, dry, and ready to pack. Keep items in small to medium sized boxes that are well labeled. Plastic tubs are ideal storage containers for clothes because they keep moisture and bugs out of your cloths. Not everything can be worn again. Possibly there are some items that you didn’t end up liking or a toy has seen better days. It’s important to take those items and donate one that you no longer need and to recycle the rest if possible. There are always people looking for gently used baby gear or kids toys. 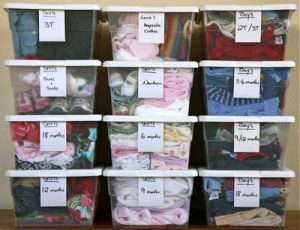 If you’re having another child you’ve saved yourself some valuable time and money by preparing and storing all of those cloths and toys properly. Be sure to re clean any belongings upon unpacking and to do a thorough inspection of items to ensure that they are still in great condition. 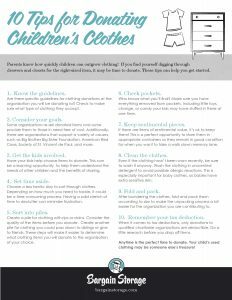 Once you’re done having children, your storage and organization process will help you sell or donate items more easily. Handing over a box of clean size 2T shirts can’t get any simpler. As always be sure to check out our facility directory to find a self storage facility near you.